DeOccupy Honolulu day 234: Since Honolulu Police Department (HPD) officers and Department of Facilities Maintenance (DFM) crews "tagged" property yesterday, todayʻs "Bill 54" seizure raid was expected. 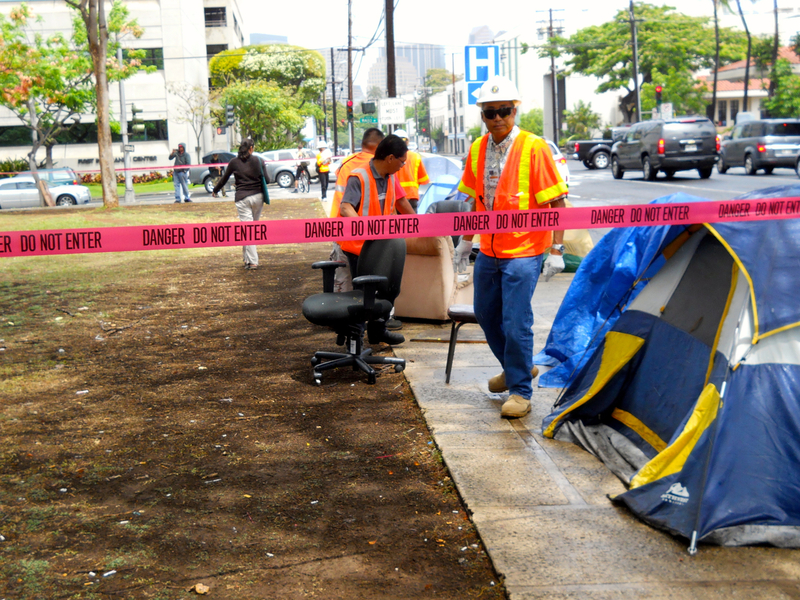 These coupled tagging & seizure raids have become somewhat routine to DeOccupy Honolulu who have endured more than 20 Bill 54 raids since the first ones on February 1 & 2. 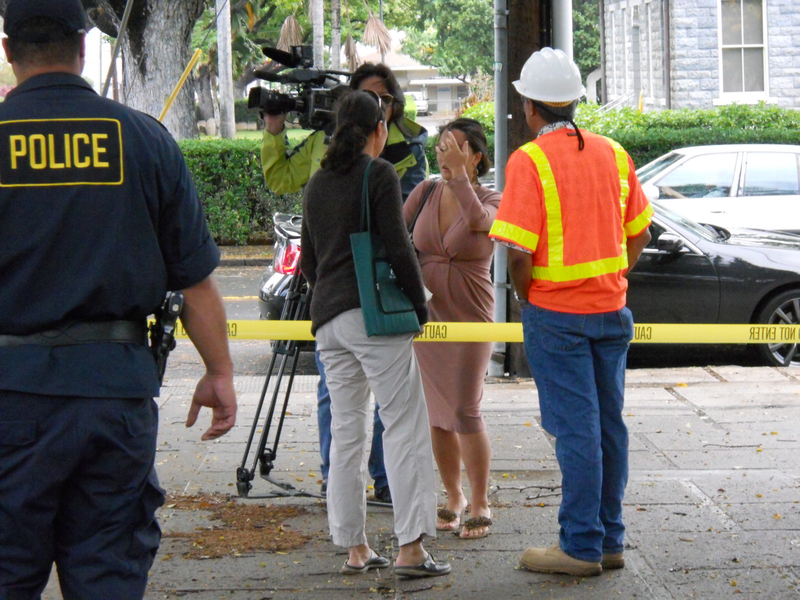 But todayʻs raid offered a glimpse into how news is effectively disappeared in the first place. I expect to see a one sided story about todayʻs raid on tonightʻs news (KHON I think, but I donʻt watch TV so I canʻt ID the reporter). I suspect one sidedness because I was at the raid, livestreamed and photographed it, saw how the "news" crew covered only a very carefully selected one half of the story. 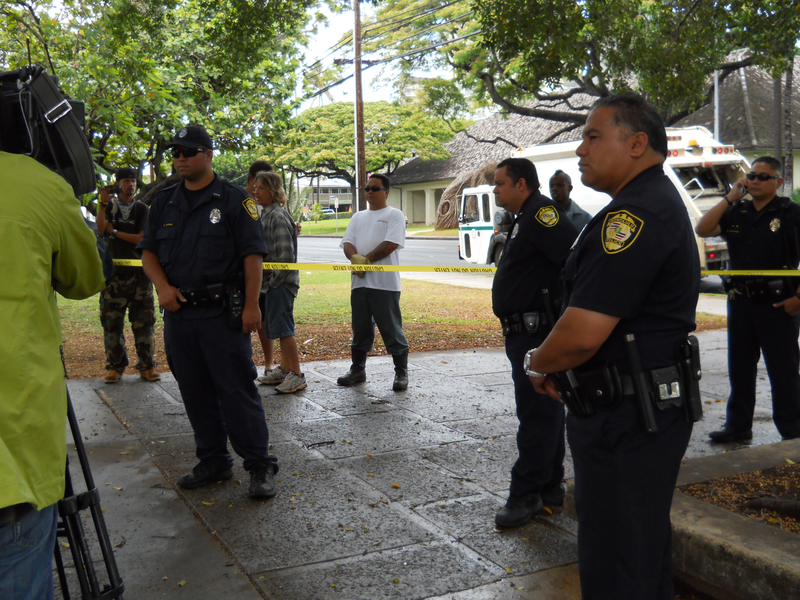 Per HPD and DFM current practice, they cordoned off the entire area in crime tape after forcing everyone out of the area. Morikawa is officially supposed to help the homeless, but seizure of dwellings (and clothing etc.) 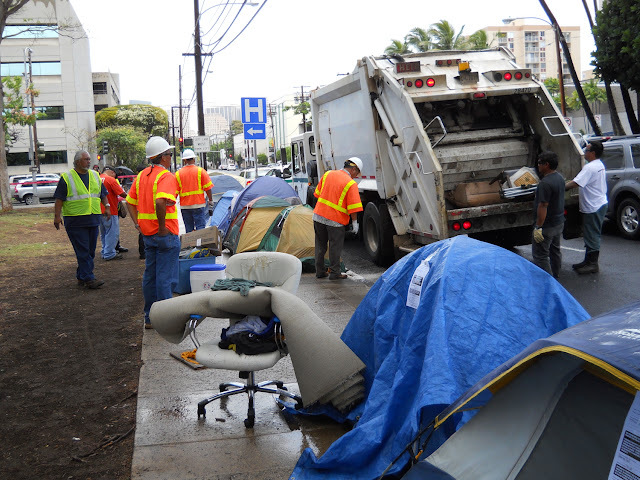 causes homelessness as those who have the least are set out on the sidewalk without even a change of clothing. She was a deputy prosecutor under Pater Carlisle when he was Chief Prosecutor. 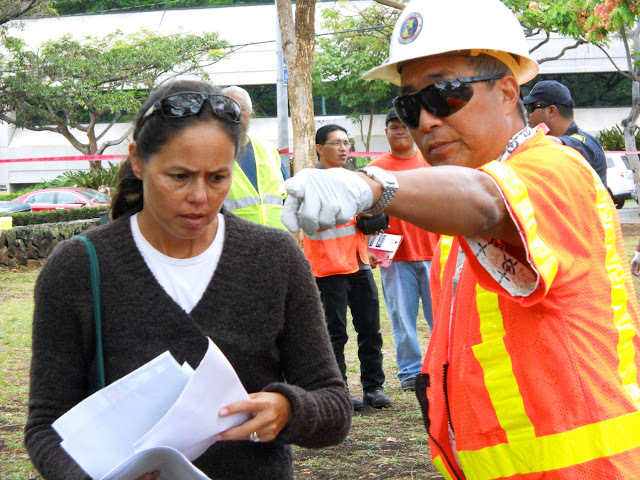 Westley Chunʻs DFM is suppose to be fixing potholes. Why is he leading raids on homeless? It's a cabinet level position that pays $112,000. He will be waving a Carlisle sign on a corner near you. The actual tags say (and the ordinance language requires) that the items be stored for reclamation. City crews do not even make a pretense of that any more and the stuff goes directly into the garbage truck. HPD and City crews then moved to the Victoria Street homeless encampment where they cordoned off the corner again. Westley Chun was interviewed, but no one at DeOccupy Honolulu, and no homeless person either. Would you believe either of these people have something to say about all this? Should we make a judgement about these raids based only on what the raiders have to say? And hereʻs the spooky question: How much of the rest of the news you see is manufactured like this? ...of the homeless - NO TAGS?! she won't wish to help those without cash. 'til the real situation's in view. Many thanks to the Masked Man! It always bugged me how much the deoccupy crew focused on media coverage as a sign of success when I used to go down there. I mean, I get wanting to get the word out, and I'm not dismissing the folks who were trying to use the media, because these same folks have been very important to deoccupy and put in a lot of work etc. There's no way corporate media could ever portray the totality of what's going on, since they exist to give surface level coverage (useful actually even to radicals in some ways), but to keep any and all framing and analysis within the "sane" parameters of pro-capitalist ideology which criminalized "rabble" and peasants who are getting in the way of business. There are good reporters, but they too are stifled by the filters information passes through before the "news goo" comes out of your idiot box or corporate paper, and most of these reporters don't really have a developed critique of their own jobs, or if they do, they can't say anything. What is useful is the kind of coverage provided in the Doug Note and the live feeds from deoccupy. Thank you for doing that, everyone involved and at the Thomas Square encampment.